Powered by a 850 -1000 mAh li-ion rechargeable batteries (included), the Kaito KA345 is an mini portable worldband receiver with advanced DSP (Digital Signal Processing) circuity, which greatly improves sensitivity, signal clarity and sound quality. With an ultra-compact size and a weight of less than 5 oz, the KA345 not only offers comprehensive AM, FM and 8-band shortwave coverage for entertainment, sports, talk-shows, and breaking news around the world, but also features an MP3 player with built-in Micro-SD memory card reader (32GB maximum) and a USB input for a thumb drive. And it fits easily into a pocket, a purse, or a backpack, and has a built-in digital alarm clock and a sleep time, truly a must-have companion to keep you entertained and informed wherever you may be, ideal for travel and outdoors activities. 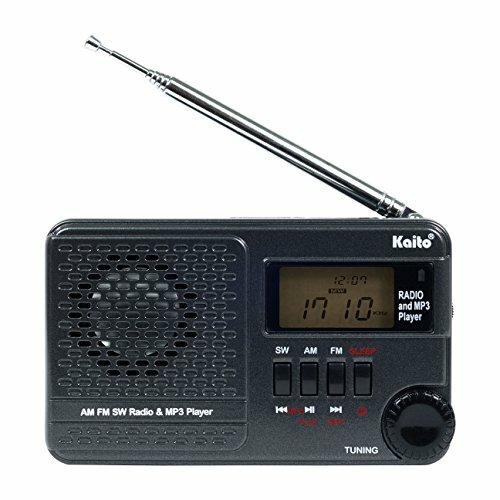 Featuring a tuning jog dial and a volume adjustment knob, plus 4 self-explanatory control buttons and a back-lit LCD display, operating the KA345 takes little effort, and thanks to it advanced modern solid-state circuitry design, tuning into your favorite broadcast at home or while travelling has never been easier. The KA345 has a built-in 40mm speaker that delivers loud, dynamic and crispy sound as well as a 3.5mm earphone jack for private listening. If you have any questions about this product by Kaito, contact us by completing and submitting the form below. If you are looking for a specif part number, please include it with your message.